Shopping for a new Toyota Prius? Stick close to the base L Eco version. It’s where the Prius is most efficient and presents the best value. The 2019 Toyota Prius adds an efficient all-wheel-drive version to appeal to more shoppers this year. Efficiency has a long hill to climb when gas is cheap. Perhaps the new all-wheel-drive 2019 Toyota Prius can climb it. This year, the Prius is available with an all-wheel-drive system borrowed from the RAV4 Hybrid, the first time it’s been offered in the States. This year, Toyota ditched a confusing naming scheme the Prius in favor of a model lineup that mirrors its other cars. The Prius is offered in L Eco, LE, XLE, and Limited trim levels. The all-wheel-drive model, which Toyota calls AWD-e, is available in LE and Limited trim levels. The Prius starts at less than $25,000, all-wheel drive adds at least $1,000 to the bottom line. The price may be attractive to some—and its stellar fuel economy should be attractive to many—but perhaps not its looks. The Prius carries forward with divisive style that’s trying hard—perhaps too hard. Compared to prior generations, the new Prius is lower and wider, with a sharper beak and many lines. The liftback rises toward the spacious rear end, but the new Prius still boasts a split rear window that's awkward in person. Inside, the Prius is updated with sharp color displays, and on some models, an 11.6-inch touchscreen. It’s tech that mirrors what’s under the hood. A 1.8-liter inline-4, electric motor, and hybrid battery combo spin out 121 horsepower. The Prius is leisurely, and built for around-town errands, but can keep pace with highway traffic. The all-wheel-drive version adds two small motors on the rear wheels that provide better traction, but don’t provide propulsion at speeds faster than 43 mph. Inside, the Prius is comfortable for four adults, but the 27 cubic feet of cargo room is more impressive. Every Prius is equipped with at least LED lights, 15-inch wheels with plastic covers, cloth upholstery, keyless ignition, adaptive cruise control, a 6.1-inch touchscreen for infotainment with Bluetooth connectivity, automatic emergency braking, and three USB charge ports. Apple CarPlay isn’t available on the Prius, however. Top trims get synthetic leather upholstery, 17-inch wheels, and blind-spot monitors. The best look on the Prius is its remarkable fuel economy. Not much on the road looks like a 2019 Toyota Prius. 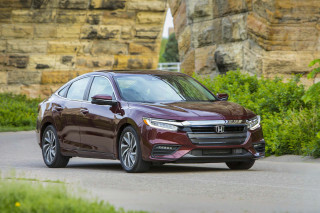 Whether that’s a good thing is debatable, but we’re still not sold on the hybrid’s snout—one too many lines, perhaps. It’s not for a lack of trying, we just think they’ve tried too hard. The same basic egg-shaped car is still here, but the newest Prius adopted a lower, sharper, and sleeker nose. 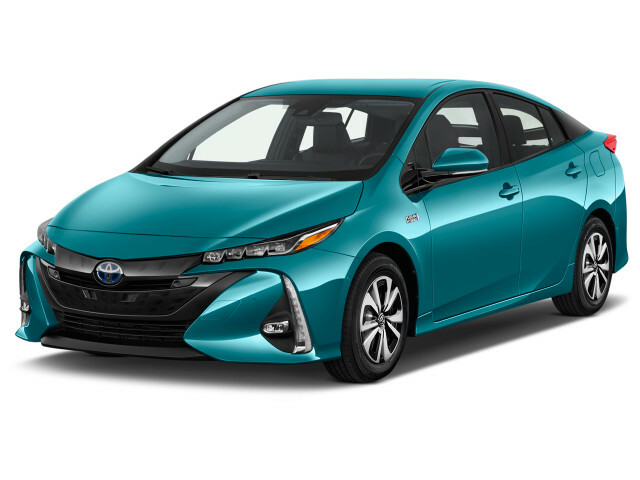 The plug-in Prius Prime smoothes over some of the more unseemly lines of the Prius, but there’s too many lines going in disparate directions: V-shaped hood, horizontal and swept back headlights, vertical “fangs” on the front bumper. Along the body sides, the Prius shapes up its once slab-sided look with more creases and bends. The rear roof pillar is black, jumping on the “floating roofline” trend that other automakers have followed. The rear end is tall, and the window is horizontally split in an odd way. The taillights have been tamed from prior years, but the horizontal arrangement still looks awkward to our eyes. The interior is heavily styled too, with a mixture of hard plastics and soft surfaces. An 11.6-inch touchscreen is reserved for top trims, but it looks a little bolted on. High-gloss plastics that festoon the gear selector and cupholders look strange to us, we’re not convinced those will age well. 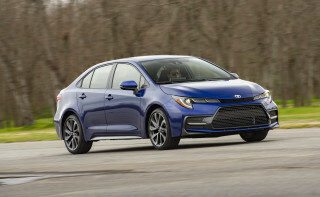 Outright speed isn’t the Prius’ forte; a new all-wheel-drive version adds cold-weather confidence for buyers. Performance isn’t the first priority of the 2019 Toyota Prius. The miserly hybrid powertrain is built for frugality, not necessarily fun. It sounds worse than we mean it; the 2019 Prius is competent on the road. Compared to prior versions of the car, the new Prius is lower and wider on the road, which imparts a better view of the road head. The Prius relies on a 1.8-liter inline-4 that makes 95 hp and a 53-kw electric motor the combines for a total output of 121 hp. All-wheel-drive versions, which are new this year, use separate, smaller rear electric motors to drive those wheels. Its net output is the same, although the all-wheel-drive running gear adds between 145 and 170 pounds to the car’s overall weight. Front-drive versions of the Prius use a 0.75-kwh lithium-ion battery pack that’s more compact and more efficient, while all-wheel-drive models use a 1.2-kwh nickel-metal hydride battery that effectively uses less of its charge although its efficiency numbers aren’t far off. The nickel-metal batteries are also more durable in cold-weather climates. Behind the wheel, regardless of driven wheels, the Prius accelerates at a modest pace, but it’s not fast. The all-wheel-drive system is designed to offer better grip at launch, and the rear motors turn off at speeds faster than 43 mph. In our limited winter testing of the all-wheel-drive version, it accelerated more confidently up snowy hills, but we weren’t convinced that a front-drive Prius equipped with snow tires couldn’t do the same. On the road, the Prius can move in and out of traffic at a reasonable pace, but high-speed passing will require some advance planning. The Prius rides atop a stiffer frame than previous generations, and shares running gear with other Toyota vehicles including the C-HR. Its suspension is still geared toward comfort, rather than outright sportiness, and its steering is light and fairly uninteresting. It’s a city runabout, after all. Toyota’s experience with regenerative and friction braking shows; the Prius is confident and efficient and blends the two braking systems seamlessly without driver interaction. Hatchback versatility with an advanced powertrain makes the Prius a smart pick for budget shoppers. The 2019 Prius has a secret: not only is it an efficient hybrid, it’s also a spacious hatchback with seating for up to five adults. The current Prius is more spacious and comfortable than its predecessors, specifically its front seats. The newer seats are more sculpted than the flat-bottomed cushions of previous generations. Up front, sharp color displays replaced the low-res readouts from yesteryear—the Prius’ tech inside finally matches the tech under the hood. There’s good room up front, but rear-seat riders are treated to more leg room than the 33.4 inches advertised by Toyota. Head room may be an issue for tall torsos because the hatchback eats into available head space for tall adults. The roofline and liftback has its perks though: under the rear hatch the Prius offers more than 27 cubic feet of cargo room, which is generous for a compact car. Mostly, the Prius offers durable materials that age well. We’re not in love with the high-gloss plastics in the center console that some models offer. They look like they will scratch and wear poorly over time. The Toyota Prius pairs good safety scores with exceptional standard active safety features. 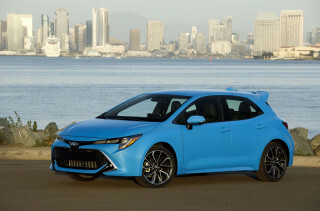 The 2019 Toyota Prius has mostly good scores from federal and independent testers that are complemented by impressive standard active safety features. Federal testers gave the Prius a five-star overall score, including four stars for front crash safety and four stars in the calculated rollover score. The IIHS called the Prius a Top Safety Pick, thanks to top “Good” scores in all its crash tests, except the passenger-side small overlap crash, where it only earned an “Acceptable” rating. Outward vision from the rear is challenging in the Prius because of its chunky rear roof pillars. The Prius narrowly misses out on a better score by skipping smartphone compatibility and a bigger touchscreen on base models. This year, the Toyota Prius adds an all-wheel-drive version for cold-weather shoppers. Base models offer good equipment for its low $24,770 price, including active safety features, but skip smartphone compatibility. The base Prius L Eco is equipped with LED lights, 15-inch wheels with plastic covers, cloth upholstery, keyless ignition, adaptive cruise control, a 6.1-inch touchscreen for infotainment with Bluetooth connectivity, automatic emergency braking, and three USB charge ports. Apple CarPlay compatibility isn’t available, which Toyota has been slow to adopt. This year, the Prius is available in L Eco, LE, XLE, and Limited trim levels. 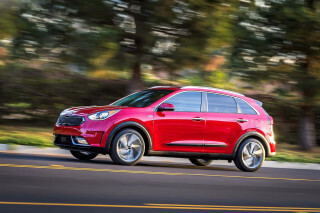 All-wheel-drive versions are available in LE and XLE trim levels. The top trim Prius Limited offers 17-inch alloy wheels, automatic wipers, synthetic leather upholstery, heated front seats, softer interior materials, remote start, a wireless smartphone charger, premium audio, a 11.6-inch vertically oriented touchscreen, blind-spot monitors, a head-up display, and adaptive headlights for just over $33,000. There may be more value in the middle of the lineup at the LE trim level, which adds to base models blind-spot monitors, seatback pockets, blind-spot monitors, and parking sensors for roughly $1,200 over the entry price. XLE versions cost more than $28,500 and offer 17-inch wheels, wireless smartphone charger, a heated steering wheel, synthetic leather upholstery, remote start, parking sensors, and blind-spot monitors. A sunroof and smaller, more-efficient tires for XLE and Limited models are notable options for the Prius. 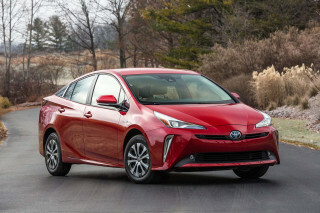 The 2019 Toyota Prius is very fuel efficient. The short of the long: Every version of the 2019 Toyota Prius manages more than 50 mpg combined. That kind of fuel economy is impressive for a car sold without a plug—the Prius can offer one of those if you’re looking for that, too. The Prius Prime plug-in hybrid is predictably the efficiency champ. 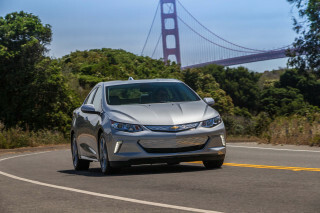 The EPA rates it for a 25-mile all-electric range, and 54 mpg combined when running as a conventional hybrid. The new Prius AWD-e rates 52/48/50 mpg, according to the EPA. The 2019 Prius Eco rates 58/53/56 mpg due to its lighter weight and lower rolling-resistance tires. 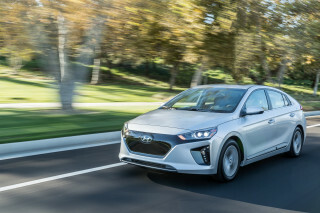 The Hyundai Ioniq and Kia Niro rate similarly. The Ioniq rates up to 58 mpg combined and the Niro can manage up to 50 mpg combined. Looking for a different year of the Toyota Prius? Lease: From $329/mo. for 36 mo.